• Cut the butter into ½ inch cubes and refrigerate. • Into a 1 cup measure with a spout, weigh or measure the egg yolk and cream. Cover and refrigerate. 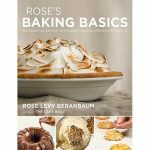 SWEET COOKIE TART OR PIE CRUST (PÂTE SUCRÉE) is excerpted from Rose’s Baking Basics © 2018 by Rose Levy Beranbaum. Photography © 2018 by Matthew Septimus. Reproduced by permission of Houghton Mifflin Harcourt. All rights reserved. MAKE THE DOUGH - FOOD PROCESSOR METHOD: In a medium bowl, whisk together the flour and salt. In a food processor, pulse together the sugar and lemon zest, if using, until the zest is very finely grated. Add the cold butter cubes and pulse until the sugar coats the butter. Add the flour mixture and pulse until the butter is no larger than small peas. Add the egg yolk and cream and pulse just until incorporated. The dough will be in crumbly pieces unless pinched. Scrape the dough into a plastic bag and press it from the outside of the bag just until it holds together. Remove the dough from the plastic bag and place it on a very large sheet of plastic wrap. Use the plastic wrap to knead the dough a few times until it becomes one smooth piece. There should be no visible pieces of butter. (Visible pieces of butter in the dough will melt and form holes during baking.) If there are visible pieces of butter, use the heel of your hand in a forward motion to smear them into the dough. MAKE THE DOUGH - HAND METHOD: Very finely chop the lemon zest, if using. In a medium bowl, stir together the lemon zest, flour, sugar, and salt. With a pastry cutter or two knives, cut in the cold butter until the mixture resembles coarse meal. Mix the egg yolk and cream into the flour mixture until the dough comes together and can be formed into a large ball. BOTH METHODS - CHILL THE DOUGH: Flatten the dough into a 6 inch disc. Wrap it with plastic wrap and refrigerate for 30 minutes, or until firm enough to roll or press into the pan. It can be refrigerated for up to 3 days or frozen for up to 6 months. If chilled for more than 30 minutes, depending on the room temperature it can take as long as 40 minutes to become malleable for rolling. • Unbleached all-purpose flour will result in as tender a crust, but due to its higher protein content, you will need to use slightly more cream: Use a total of 38 grams/2 tablespoons plus 2 teaspoons (40 ml) cream. The higher protein content in the flour will cause the crust to brown more quickly, so watch carefully when baking.